NEW!!! 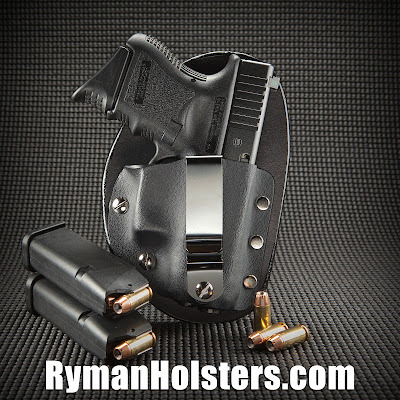 Fixed retention IWB holster from Ryman Holsters. The base unit is $39.95 at the time of this posting. 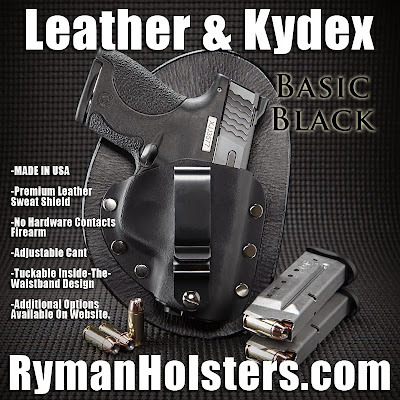 That price includes black leather, black kydex, fixed retention, and a spring steel clip. 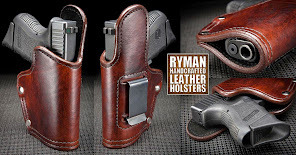 As with all of the leather and kydex hybrid holsters form Ryman Holsters, this model features adjustable cant, premium leather sweat shield, tuck-able inside the waistband design, MADE IN THE USA. No hardware contacts the firearm. Additional features are available in the web store. 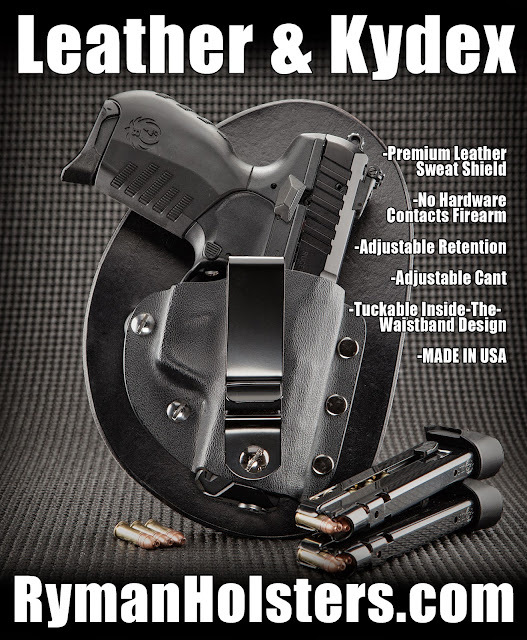 Leather & Kydex IWB Holster- New Options! The other request was for Kydex belt clips. I've developed a couple of shapes and a couple of length options. 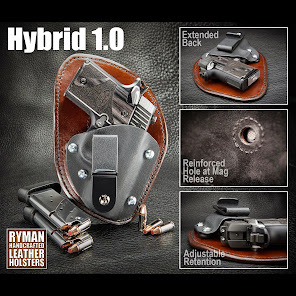 Ryman Holsters' New YouTube Channel! 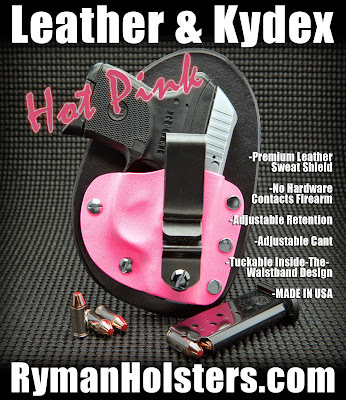 Be sure to subcribe and follow me on facebook for the latest holster deals and give-aways! 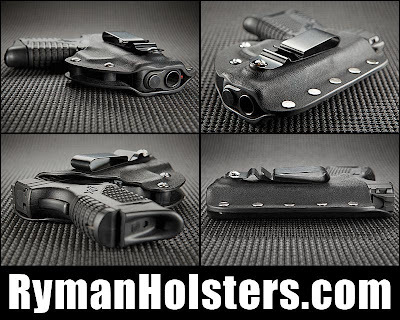 Here's a hybrid style concealment holster for the Ruger SR22 pistol. 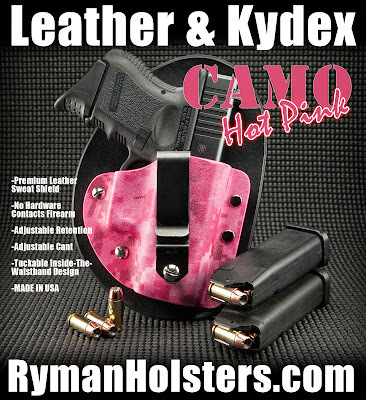 This holster features adjustable cant and retention. No mounting hardware touches the firearm. 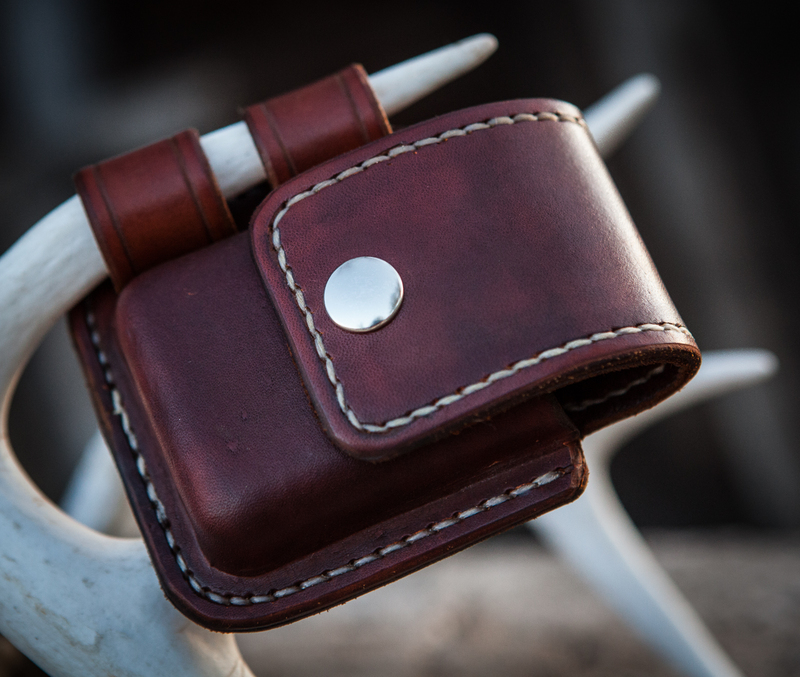 The inside-the-waistband design allows for tuckable carry. MADE IN THE USA. Finished these up this afternoon! 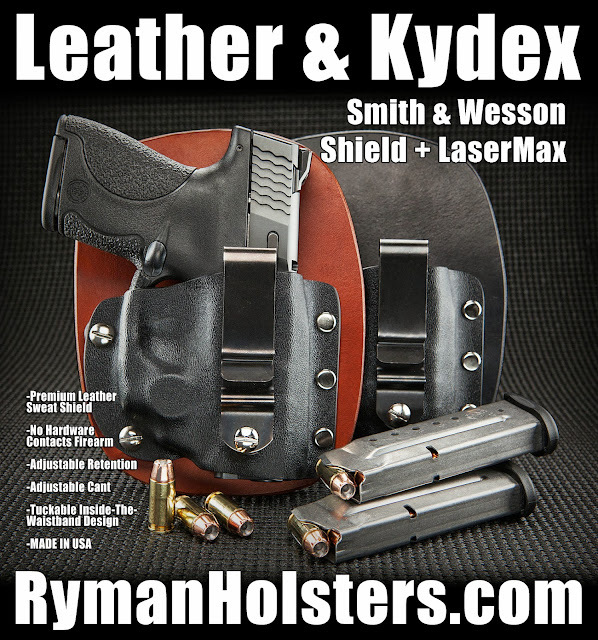 They fit the Smith & Wesson Shield with the LaserMax. These are kinda tricky to form because you have to relieve the area around the laser switch without compromising the retention near the trigger guard. 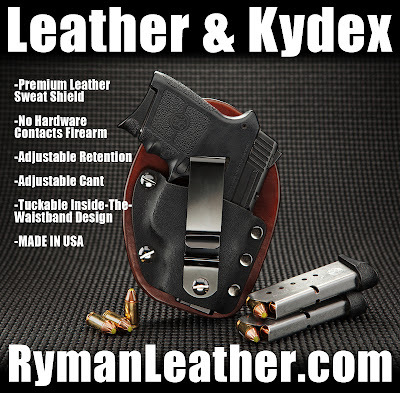 Leather and Kydex now available for a wide variety of of pistols. 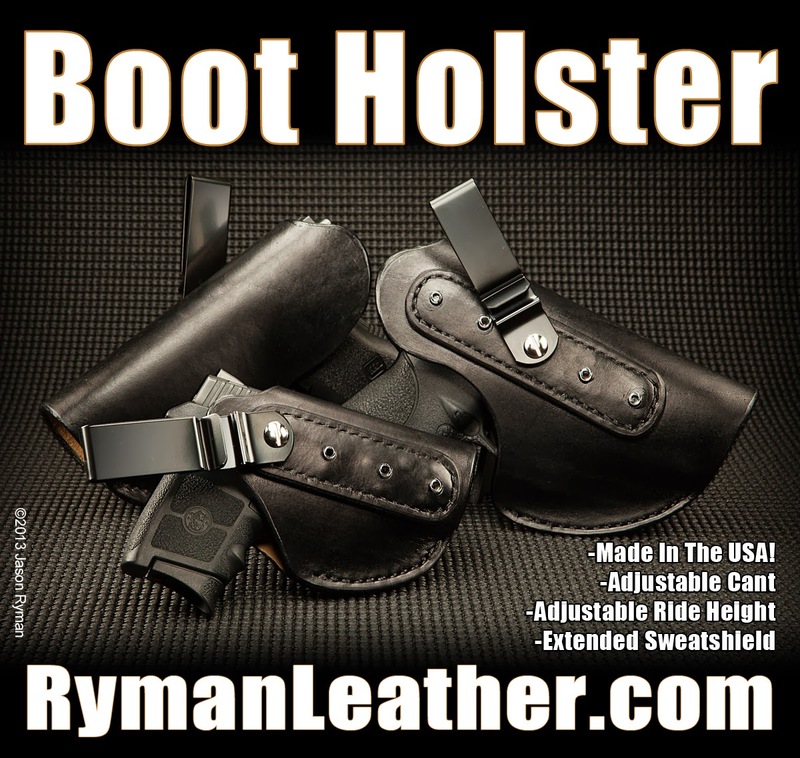 Here's link to our store, www.RymanHolsters.com, if you'd like to purchase a holster. Turn around is about a week right now. 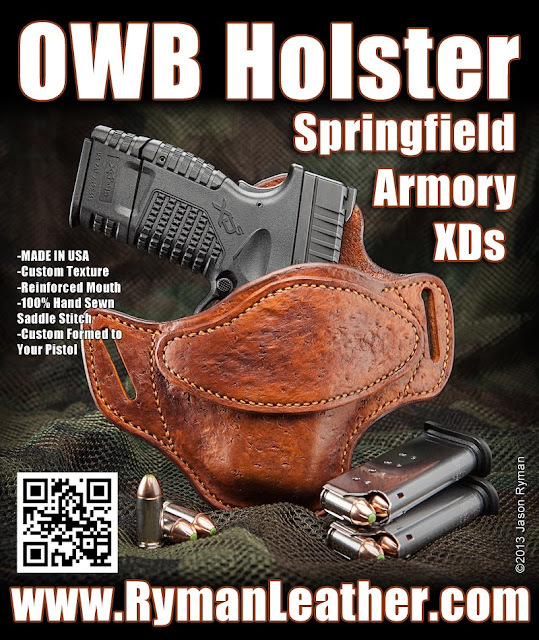 IWB Holster for Glock 26 and Glock 27. 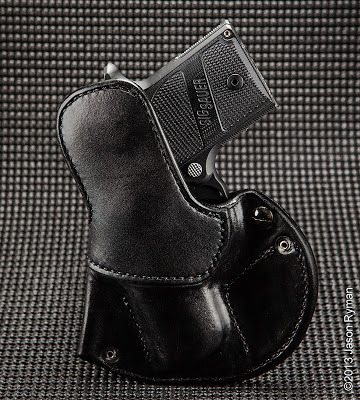 About the holster... it's a 0.060" Kydex shell, molded to a specific firearm, and attached to a high quality piece of 8-9oz leather- finished on both sides. It's very comfortable against the body. 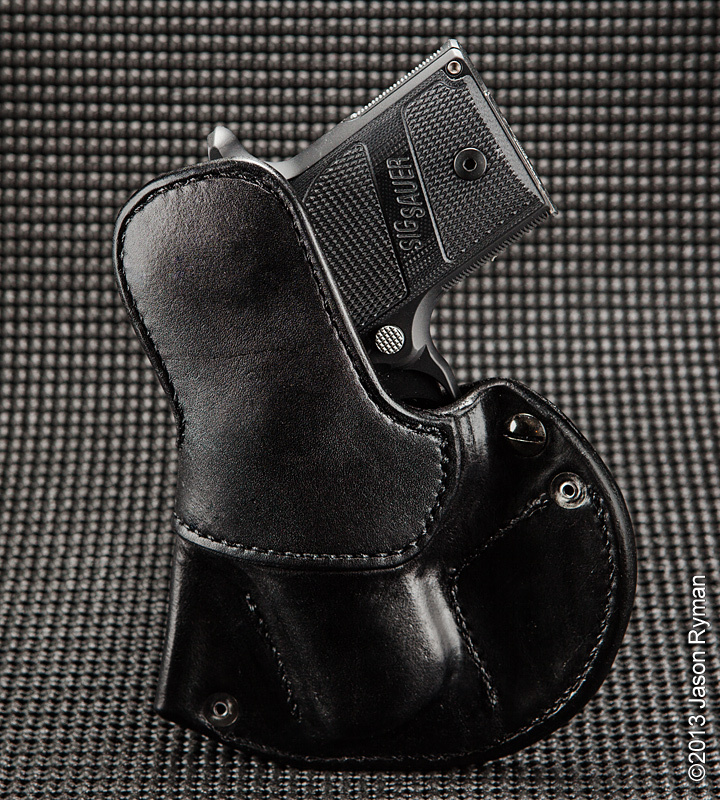 The sweat shield portion of the leather back is extended so the pistol beaver tail, hammer, or rear of the slide won't rub against the body. 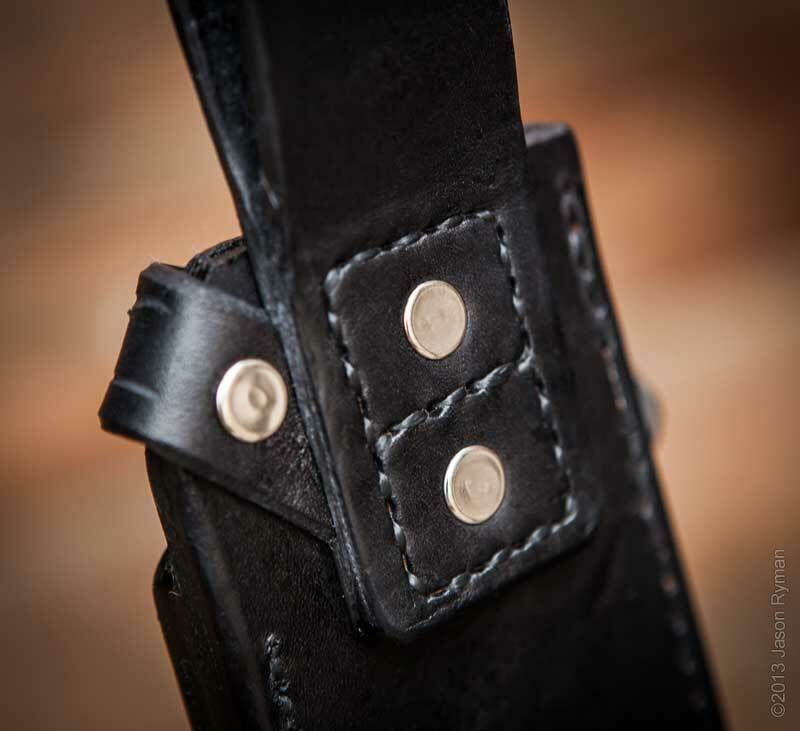 There are two retention adjustments on the trigger side of the holster. The cant is adjustable by the screw on the spring clip. 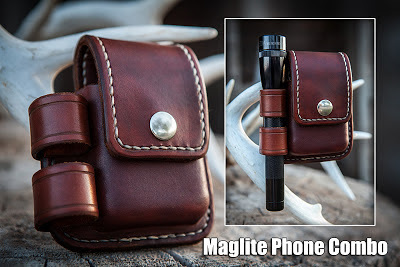 The leather near the mag release is relieved so the mag won't be inadvertently ejected. No mounting hardware comes into contact with the firearm. It's available in right or left hand carry. Let me know if you'd like one! 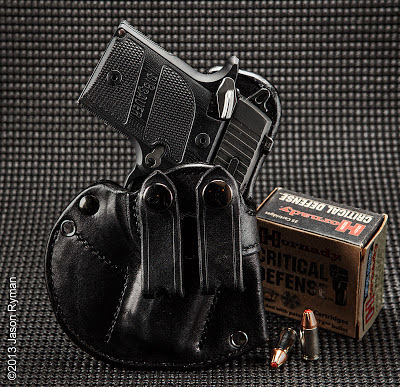 Retention Type: Adjustable retention offers two adjustment points near the trigger guard and two adjustment points on the slide side of the holster. The hardware is completely covered on the body side of the leather back. Fixed retention is snug and not adjustable with polished rivets visible on both sides of the leather back. 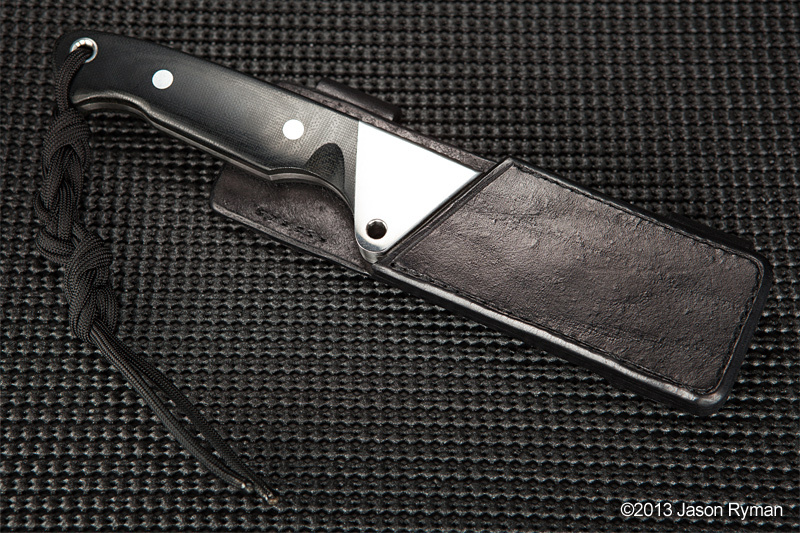 Cutaway vs. Standard Back: Some of my clients have requested a cutaway style leather back. They prefer an open back in the area of the grip. The sweat shield still extends past the top of the pistol. 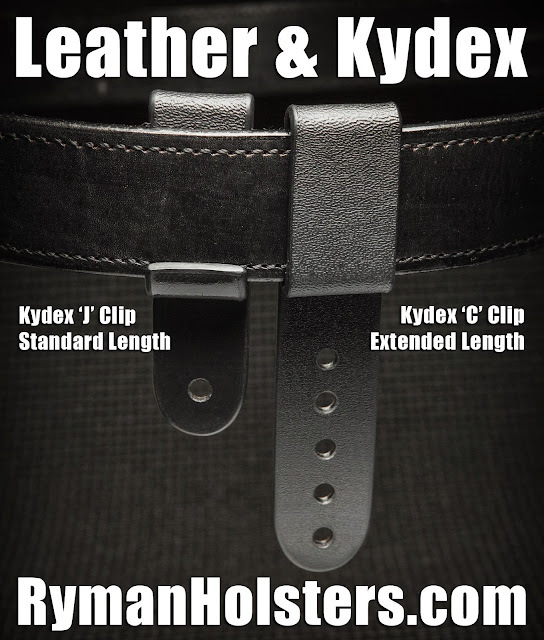 Belt Clip Type: If you're concerned about potentially scratching your belt, I suggest you choose one, or both, of the Kydex clips. 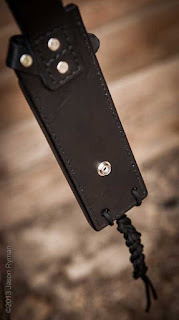 The 'C' clip wraps around the outside of the belt. The 'J' clip wraps over the top edge of the pants, but stays behind the belt. 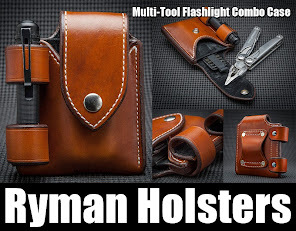 Either type allow the holster to be removed without removing the belt. 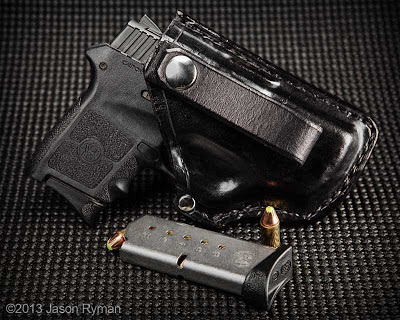 NOTE: Kydex clips replace the steel clip. 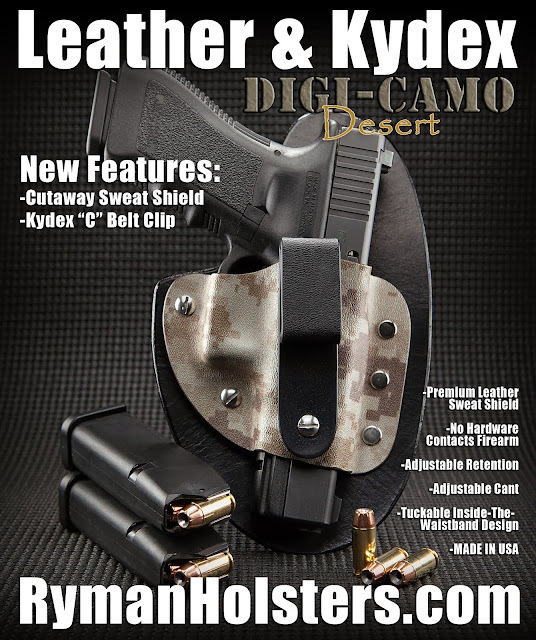 The steel clip will be included with Kydex Master Pack of clips. Belt slots and clips fit up to 1.5" belts. Please let me know if you wear a wider belt. 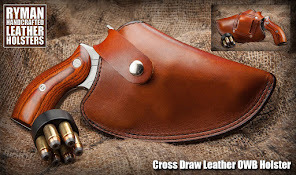 Several folks ask about boot holsters for other pistols... so I made some! 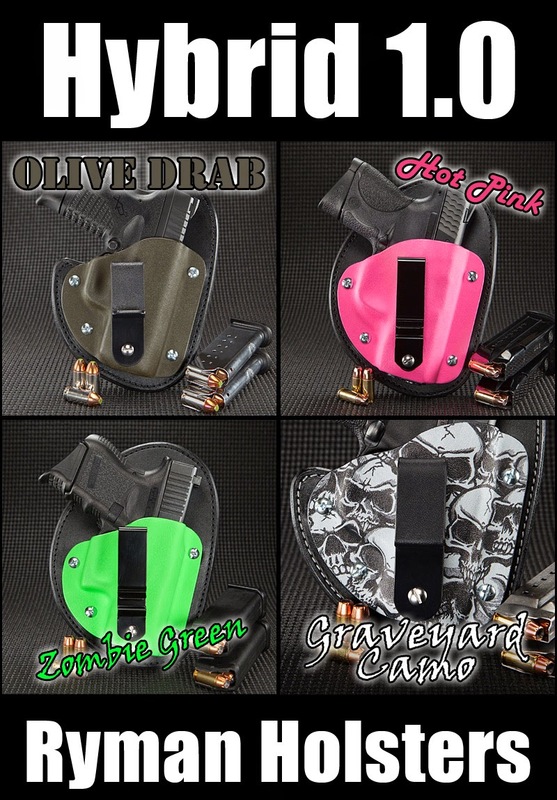 The bigger size fits Glock 26/27, M&P 9c, Shield, and XDs 9 & 45, as well as similar size pistols. Add the 7 shot extended mag to the XDs45 and it makes a great pistol for outside the waistband carry. 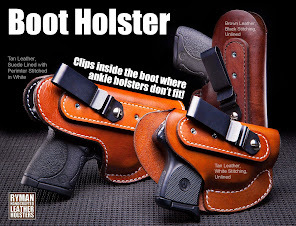 Here's a great holster to go with it! 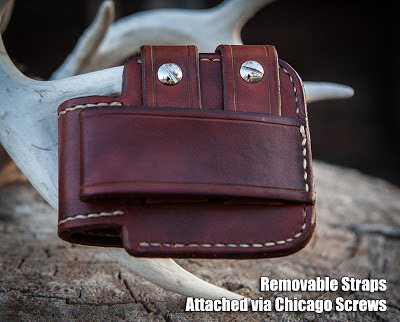 It's completely hand sewn saddle stitched (no machine stitches). Available in black or tan. Cost is $100, add $25 for texture. S&H is only $10 anywhere in the continental US. Here's one I just finished up... it's an IWB with optional spring clips or straps that go around the belt. The cant is adjustable. 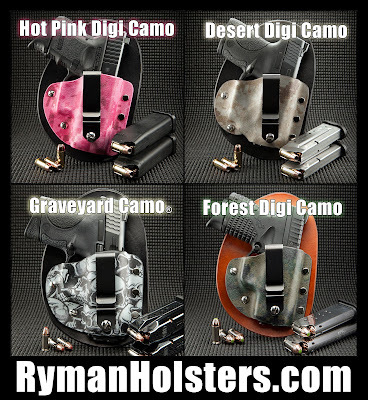 Let me know if you're interested in a custom holster for your rig! 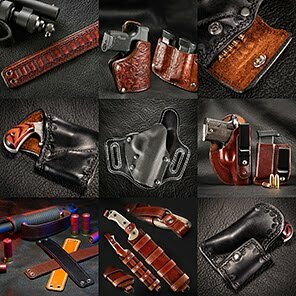 www.RymanLeather.com. 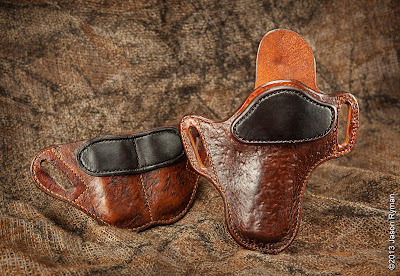 Custom holster for a 1911 and a two-mag carrier. This client requested a two-tone finish, burlwood with darkwine reinforcing straps. 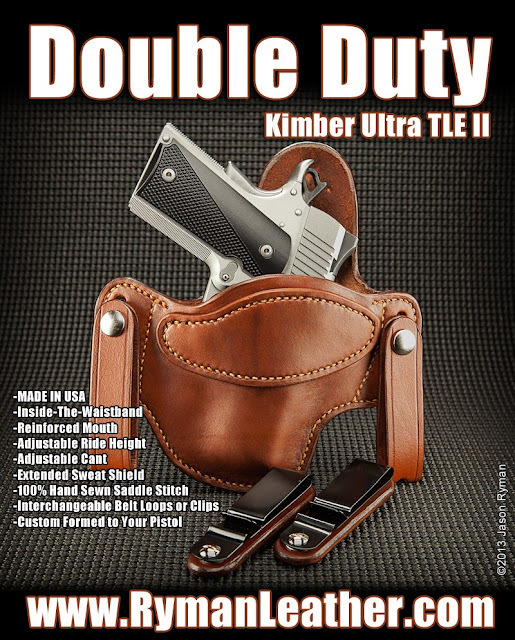 Custom two-tone leather holster for 1911 and a matching double mag carrier. 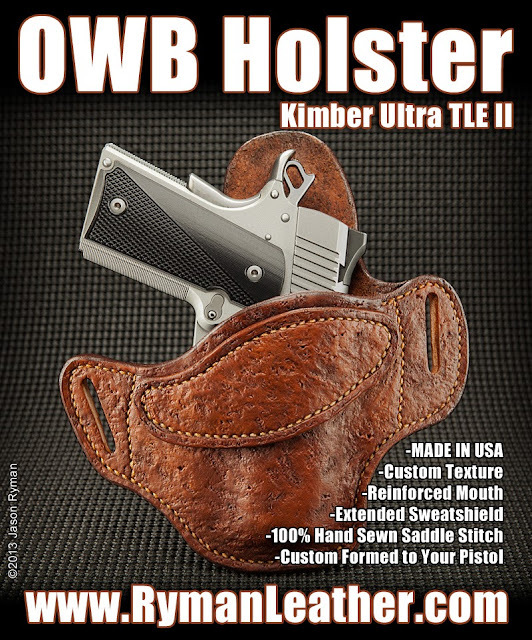 Let me know if you're interested in a custom rig for your 1911 other style of handgun! 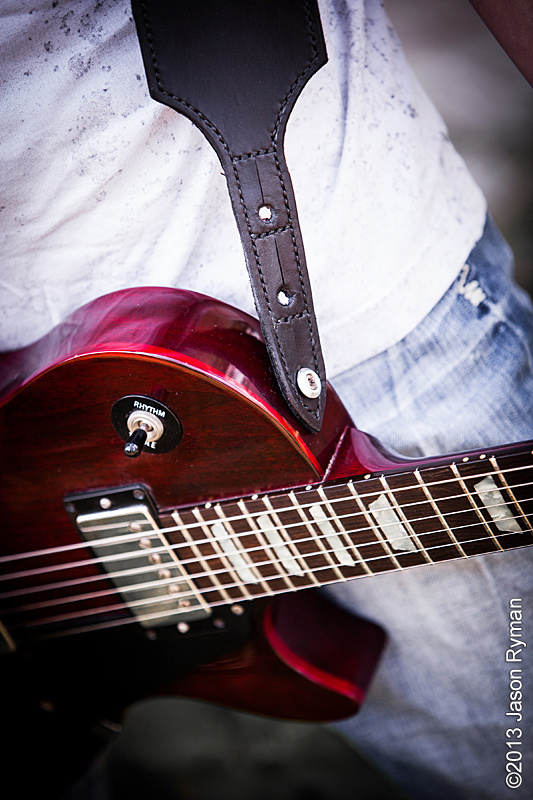 Custom made, padded, leather guitar strap with pigskin lining. 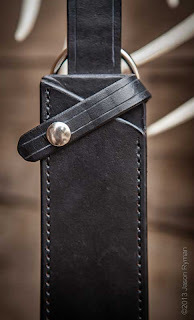 Custom made, padded, leather guitar strap with pigskin lining. 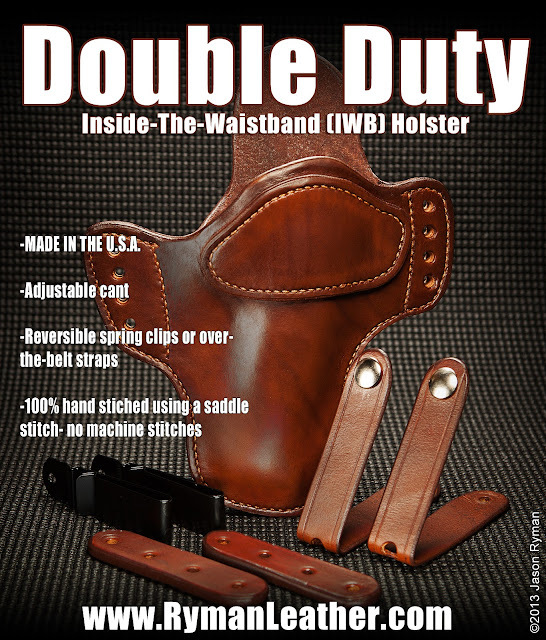 100% hand sewn (saddle stitch). 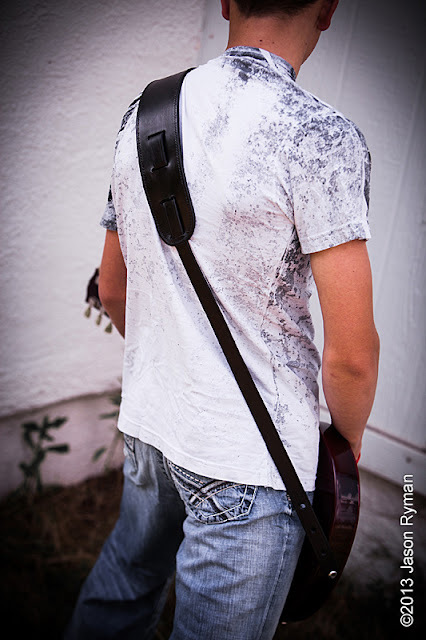 This strap is longer and wider (3 inches wide) so it will hang low for the rocker types and be comfortable for the extra-large guitarist or bassist. Let me know if you're interested in a high quality, hand made strap! 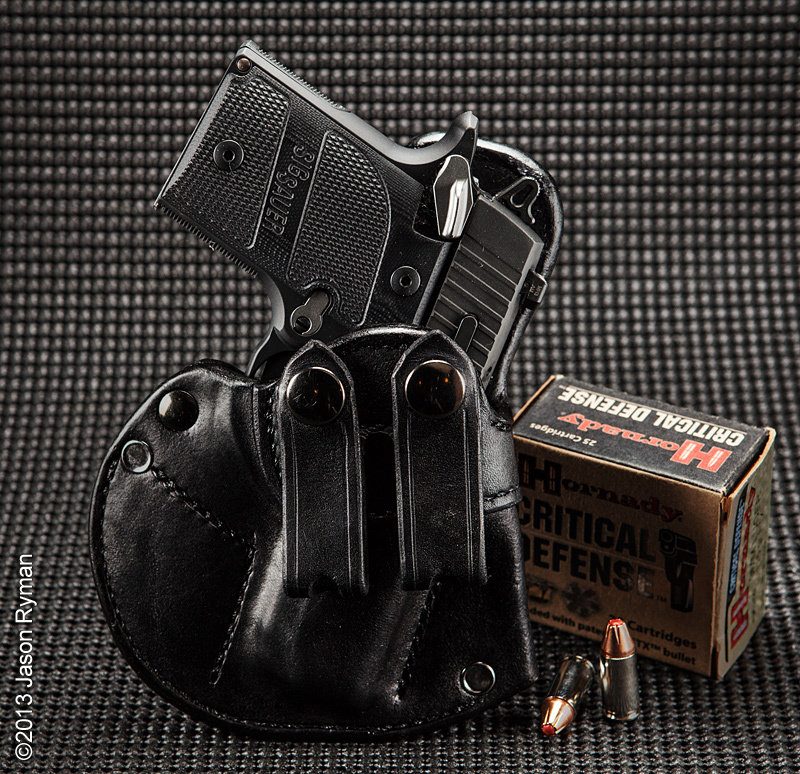 This custom leather IWB holster is based on a commercially available line. Currently, they don't make one for the Sig P938. Let me know if you're interested in a custom leather holster for your carry rig! This sheath is designed to be carried horizontally. 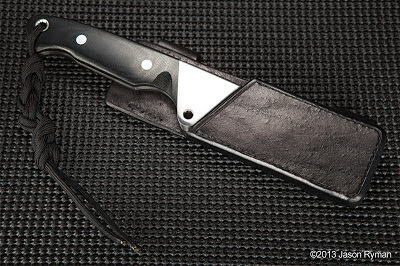 It features an extra tight fit so a retention strap is not necessary to hold the knife in the sheath. 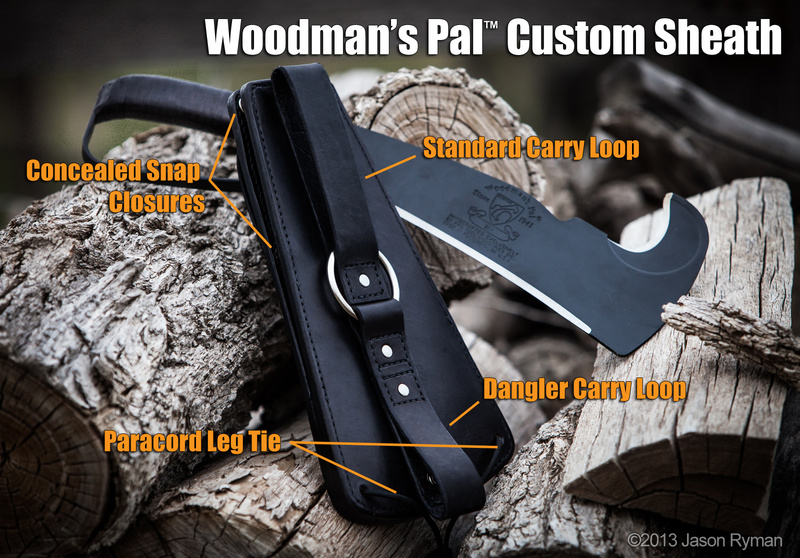 This custom sheath for the Woodman's Pal can be worn as a traditional sheath or as a dangler style sheath. When not in use, the dangler loop attaches to the back of the sheath via snap closure. When the dangler is in use, a length of paracord is used to tie the bottom of the sheath to the leg. This prevents it from flopping around. 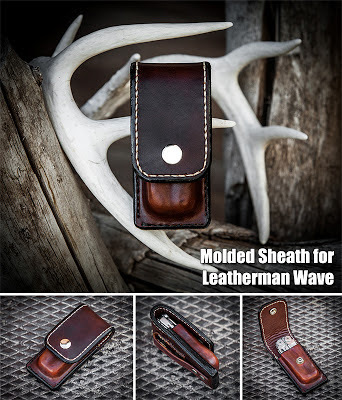 The body of the sheath is 5 layers of 6-7oz leather, including the welt. The Woodman's Pal is held inside the sheath by rotating the the hook of the blade into the sheath. 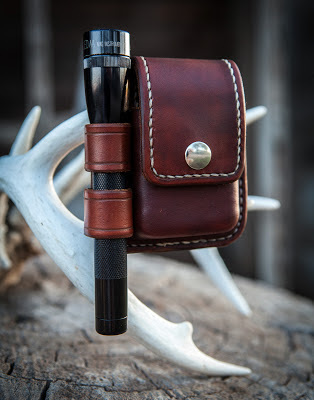 It is further secured with two concealed snap closures. The front features a smaller sheath for a stone or other tools. This is a custom molded sheath for a Leatherman Wave. It's lined so the snap hardware won't cause wear marks on the tool. 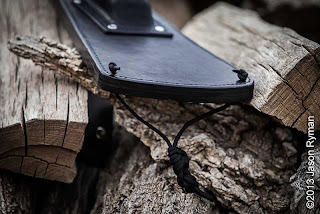 This knife sheath can be worn in two ways; as a traditional sheath or as a dangler. 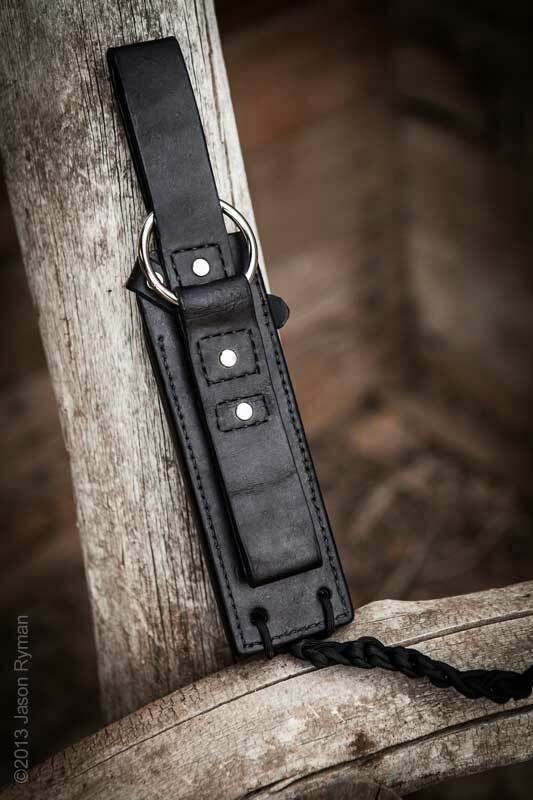 When the dangler is not in use, it is stowed on the back of the sheath and secured by snap closure. 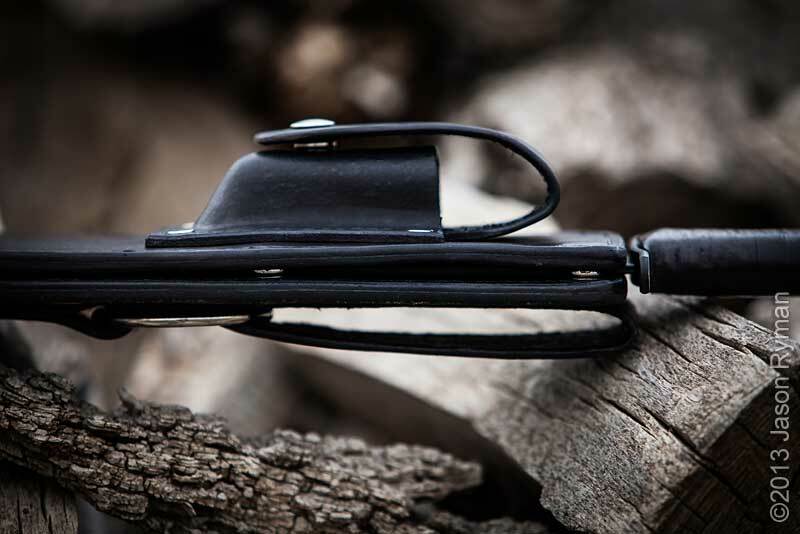 When the dangler is in use, the sheath can be secured to the leg by paracord. 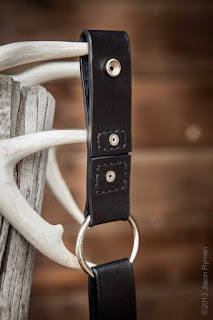 This prevents the sheath from flopping around. This custom case holds a small phone and a AA size Mini Maglite®. 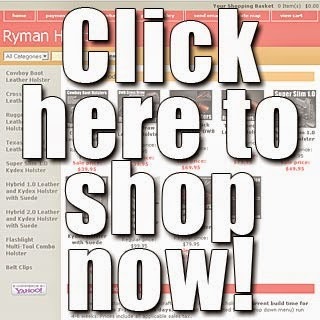 Welcome to my new site- Ryman Leather! 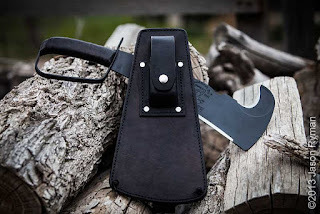 I make custom leather sheaths and holsters. Let me know if you're interested!